Sandy Terry draws inspiration from the abundant natural beauty of British Columbia. 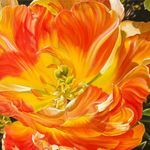 She paints award-winning, dramatically elegant florals in acrylics. Her work is in private collections in Canada and the United States.